I have a wonderful book called Jerusalem by Yottam Ottolenghi and Sami Tamimi. Kind of an ode to their home city, it’s filled with stories and delicious recipes. I like middle eastern food because for me it strikes a perfect balance between the heavily spiced dishes of the subcontinent further east, and the simpler, more fresh cuisine found in the mediterranean to the west. Jerusalem is an ancient city with a turbulent history; having been besieged, conquered and captured countless times. As a result it’s a city of many varying cultures, religions and traditions, and the food of Jerusalem reflects this diversity. 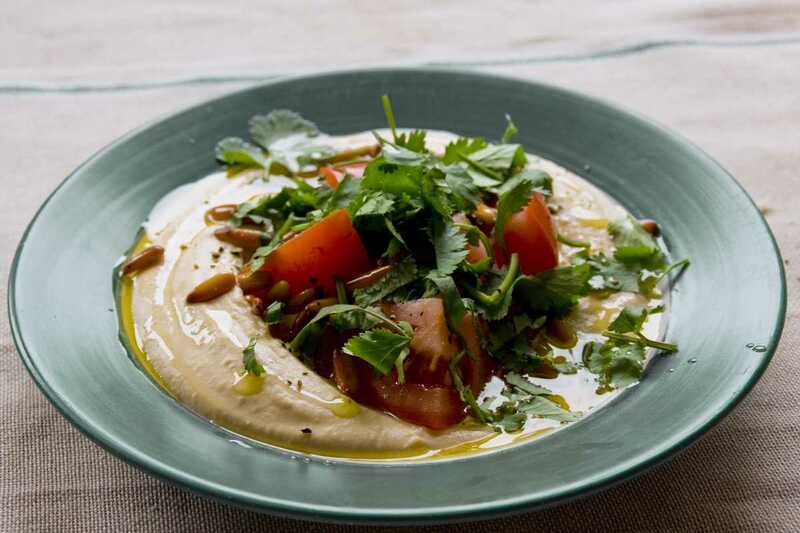 Hummus is a big thing in the middle east, especially in Jerusalem, and unsurprisingly there is an endless debate from opposing cultures about how it should be prepared; warm or cold… smooth and creamy or rustic and chunky. And which spices or garnishes to accompany it, if any at all. Most of the hummus I have had from the shops here in the UK have been almost smooth with a slight grainy texture to them. This recipe from Ottolenghi is really smooth and creamy, and much lighter in colour than hummus I’ve had before. It’s opened my eyes to how great hummus can be… I definitely recommend you try it! I made it into a light lunch by simply garnishing it with a pile of chopped coriander, tomatoes, pine nuts and olive oil. I devoured it with some fresh toasted pitta bread. Fantastic. Wash the chickpeas in cold water, then cover with at least twice their volume of water and leave overnight. Drain the chickpeas. Place a medium-large pot on a high heat, then add the chickpeas and the bicarbonate of soda. Cook, whilst stirring, for about 3 minutes, then add 1.5litres of cold water and bring to the boil, skimming any scum that rises. Simmer gently for 20-40 minutes, or until the chickpeas are very tender but not mushy. Drain the chickpeas and place in a food processor. Blend until you have a thick paste, then, with the machine running, add the tahini paste, lemon juice, garlic and 1 ½ teaspoons of salt. Lastly, add the iced water gradually and mix until you have a very smooth creamy paste. Place the hummus in a bowl, cover with clingfilm and leave to rest for 30 minutes before eating.